Testify. All the people that Boaz had gathered to hear the legal proceedings now are to be witnesses and testify of what they have heard. 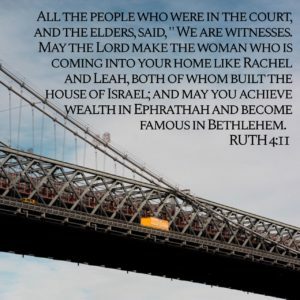 Read Ruth 4:11-12. Not only are the people supposed to listen to the people,they’re supposed to participate and actually testify of what they know to be true. These people heard the commitment that Boaz made to take Ruth as his wife. Now, they are to go and to testify to anyone who asks that Boaz did this and why. Do we hear what others are doing and do we testify to what that is? Are we willing to stand up and say, this is what happened? As followers of Jesus Christ, we have an opportunity to share what we have experienced through God. The question becomes, will we do that?